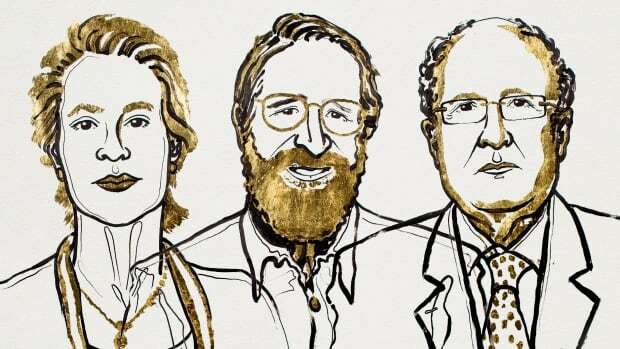 Scientists Frances Arnold, George Smith and Gregory Winter won the 2018 Nobel Prize in Chemistry for research using directed evolution to produce enzymes and antibodies for new chemicals and pharmaceuticals, the award-giving body said on Wednesday. Arnold, only the fifth woman to win a chemistry Nobel, was awarded half of the nine million Swedish crown ($ 1.29 million Cdn) prize while fellow American Smith and Winter of Britain shared the other half. "This year's Nobel Laureates in Chemistry have been inspired by the power of evolution and used the same principles — genetic change and selection — to develop proteins that solve mankind's chemical problems," the Royal Swedish Academy of Sciences said in a statement. Arnold is the second woman to win a Nobel Prize this year after Donna Strickland, from the University of Waterloo in Ontario, shared the physics award on Tuesday. The uses of enzymes, developed by Arnold, include more environmentally-friendly manufacturing of chemical substances, such as pharmaceuticals, and the production of renewable fuels for a greener transport sector. Smith developed a method using a virus that infects bacteria to produce new proteins. Winter used the same method for the directed evolution of antibodies, with the aim of producing new pharmaceuticals.